Hey, Mother Jones I thought, that’s not the Kool-Aid I knew! Why is Kool-Aid always the fall guy? First there was Tom Wolfe’s silly book, The Electric Acid Kool Acid Test. OK, I admit it, I read it. And yes, I enjoyed it. But why Kool-Aid? Couldn’t Ken Kesey and his Merry Pranksters use something else to down their LSD? It could have been the Electric Raspberry Lemonade Acid Trip. Then there was Jim Jones and the Jonestown tragedy. I won’t dwell on tragedy but it did leave Kool-Aid with a besmirched name, and it led to people’s saying “Don’t drink the Kool-Aid” when they think someone’s blindly following an idea. Look, I wish Jim Jones had not used anything at all to mix his poison, but I’m just saying, if he’d used milk people would be saying “Don’t drink the milk”, and I’d be fine with that – I don’t like milk. Why you might ask am I so sensitive about Kool-Aid. 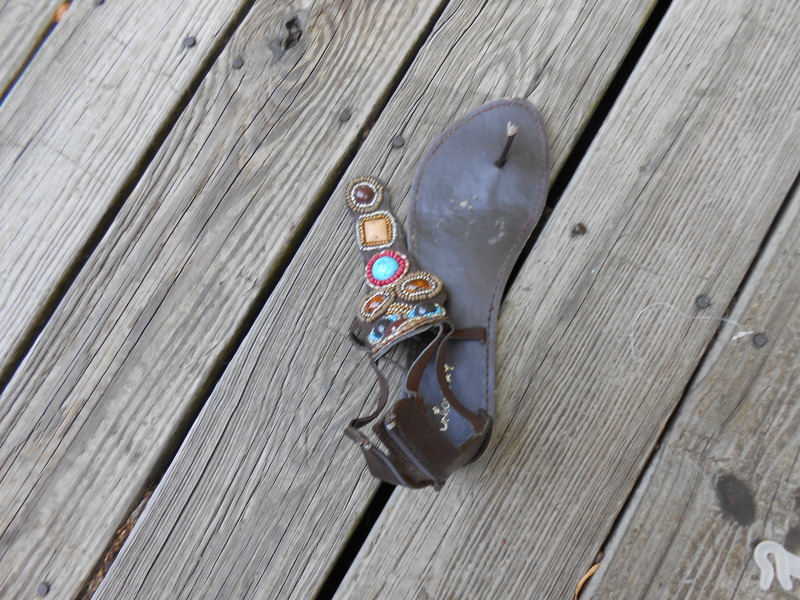 Do you remember my blog entry about how summers on Cape Cod did not officially begin until my brothers and I had bought our flip flops? Well Kool-Aid kept the summer going. If not for Kool-Aid, we’d have died of thirst with our flip flops on. You see, we were not a water-drinking family – unless it had Kool-Aid in it. and I didn’t like cherry. Brother A did, but too bad. He wasn’t the oldest! The twelve envelopes would just make it until the next week’s trip into Hyannis for grocery shopping. This was summer time, and that meant my mother had to make a jugful to bring to the beach each day, plus a pitcher for the fridge because brother B was the most generous of the three of us, and he was always bringing his friends in for a glass or two. Then there were the Kool-Aid pops. We’d save all our Popsicle sticks for weeks in preparation. After all, they were the most important part of the recipe. My mother would make the Kool-Aid and pour it into an ice cube tray with a stick in each section. Then she’d stick the tray in the freezer for an overnight stay. The freezers of the early 60’s lacked the oomph of today’s freezers. Getting the pops out of the tray wasn’t as easy as you younger people might think, or as quiet. Ice cube trays of that era were metal, not plastic – no flexibility. I took a field trip last Saturday – to the powdered beverage aisle in the supermarket. I wanted to confirm my memories before I set them to paper. Yes, one envelope makes two quarts. And the directions for pops was still on the back, but what surprised me, besides the fairly reasonable cost of 20 cents, was the calorie count – zero. Were they now making diet Kool-Aid? One cup of sugar spread out over two whole quarts of water? That doesn’t sound so bad to me, Mother Jones, but then you’ve never seen me adding sugar to my coffee, have you? They say summer 2012 arrived on June 20 at 7:09 PM. But it all depends on which they you listen to. In the United Kingdom, the British they proclaimed its arrival at 23:09. However down in the southern hemisphere in places such as Argentina, Australia, and South Africa, they see things altogether differently. There they say June 20 marked the start of winter and that summer won’t be here until December. And then, there’s the House of Mars. I am the resident they and I say summer 2012 bounded onto the scene on June 30 at approximately 5:00 PM. Why so late? 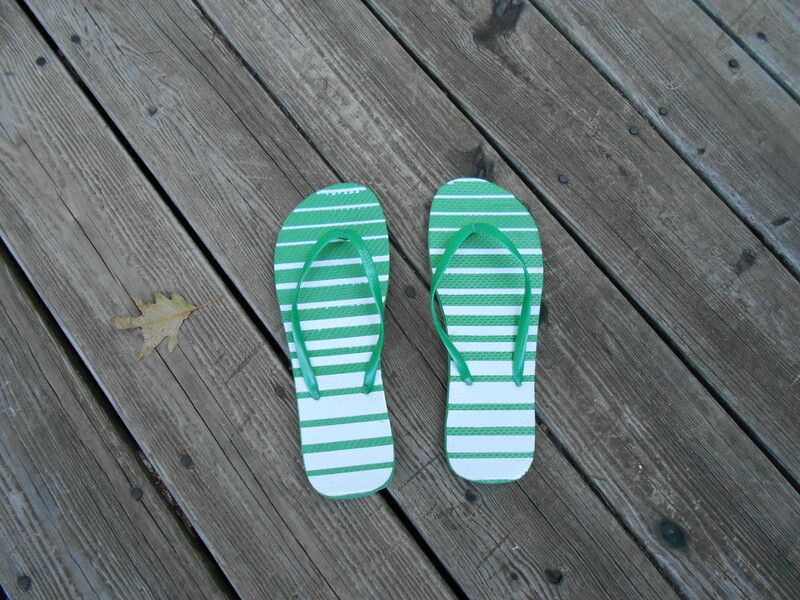 Summer does not begin for me until I have bought my first pair of cheap, rubber, easily blown out flip-flops. And when I say cheap, I mean $1.00 as in the Dollar Store. Most years, starting in May, my friendly neighborhood Dollar Tree has a table piled high right by the entrance, and just in case you miss them, or you didn’t find the color you wanted, more are hanging by the checkout. But this year – nothing. I was checking every Saturday and was beginning to fear I’d have no summer this year. I was getting dangerously close to my temper tantrum threshold. I needed my flip-flops. With one day left before July, I tried again. My visit didn’t start on a high note. Solar lights occupied the flip-flop table, but there by the checkout – there they were. Sure I could have bought a pair at Wal-Mart or Payless. I even saw some in CVS. But it had to be Dollar Store. Why? Because that’s the closest thing to F.W. Woolworth in today’s world. I guess I have to go back to my childhood to explain. My family used to rent a small beach cottage in Cape Cod each summer. We’d arrive at the end of June and while my parents unpacked we’d run down to the beach to see if anything had changed over the winter, then check out the other cabins to see if there were any new kids. But while we were finally in Cape Cod, we weren’t officially there yet. That would have to wait for the next day when my dad drove us to the Woolworth’s on Main Street in Hyannis– to get our flip-flops. Although in those days we called them thongs, this being decades before underwear usurped the word. Yes, every year we’d ponder, hold-up, try on, and finally when my mother had come to the end of her patience, and make our decisions. And each year we’d make the same decision: brother #1 would choose green, and brother #2 would choose yellow which left me with blue or red. Usually I got blue. Looking back I don’t know why we felt we had to get different colors. We were not going to get them mixed up. Five years separated me from brother #1 and he was five years older than brother #2.. If Goldilocks ever wandered in to our cabin and saw them lined up she’d assume they were Papa Bear’s, Mama Bear’s and Baby Bear’s. This year, I was really drawn to a bright purple pair, a color never available back in the 1960’s. But on closer examination I notice the thong strap was twisted – a sure sign of premature blow out, and I don’t need any help in that department. My choice was made for me. They only had one color in my size – colossal ten. I got them not a moment too soon. On July 1, I was taking the garbage down to the garbage can. I hadn’t broken in 2012’s flip-flops and had slipped into an old fancier version of flip flops I’d been wearing around the house and yard. Oops, I tripped on a tree root. Coincidentally I’d bought them during a visit to the Cape nine years ago. Yep I got nine years out of them. Don’t believe me? 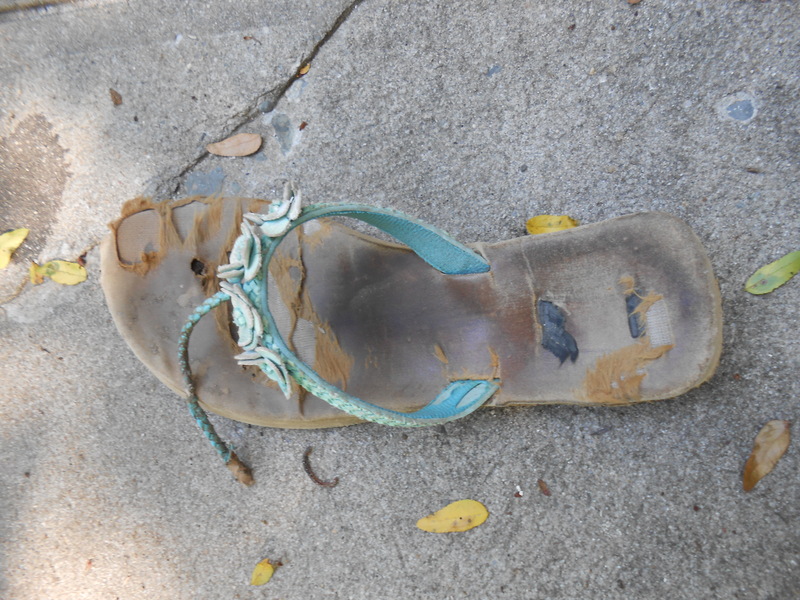 July 2, while walking in the city, in a strappy version of flip-flops, I tripped on a crack in the sidewalk. Man! I’d just bought them last year! Do you think I should go back to Dollar Tree and get a spare pair? The summer is still young.